I was trying to explain to a friend of mine how crazy shedding season is for horse owners. 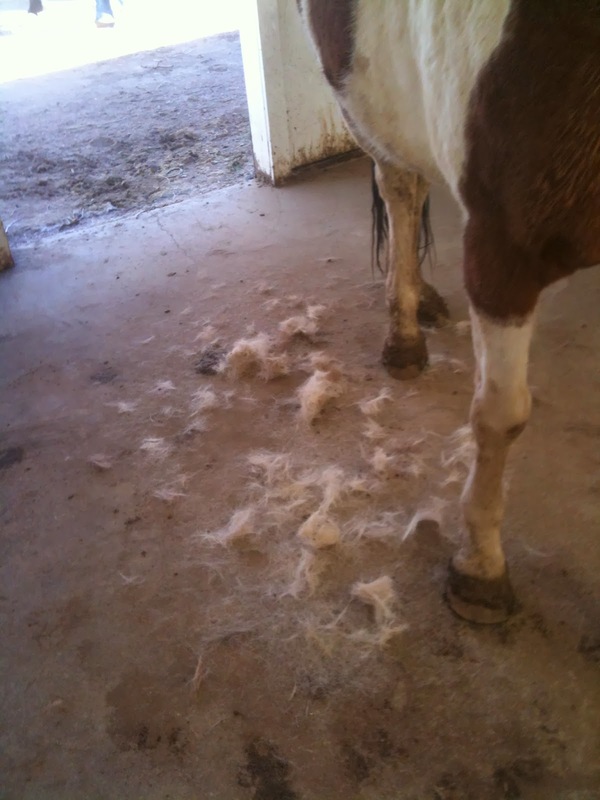 For months it's nothing but torrents of hair coming off the horse every single time you groom them -- or even so much as pet them. The joke among my horsey friends is that you learn the hard way not to wear chapstick when you come to the barn... If you are a horse owner, you will know what I mean by that! For some reason, Panama always starts the process of shedding out well before Rondo, so Panama has been shedding like crazy for a few weeks now. I always hate how early he starts, because in Colorado, our two snowiest months are March and April. We inevitably get some big spring storm (or two) that he isn't equipped to handle any longer, which means I have to be more proactive with the blanketing. This spring is especially welcome, though, since we have had such cold temperatures this year. The days are warming up more now: Sunday and Monday were in the high 60s, and after a spring snow blew threw on Tuesday, the temperatures shot right back up to the 50s. We have another quickie storm coming through over the weekend, but otherwise it looks like the temperatures should stay in the 50s and 60s for a little while -- such a relief! As the weather warms up, I plan on riding more, but also on hitting the trail more frequently. I really need to get Rondo out on the trail this summer. He is shaping up to be my "guest horse," since I can trust him with the beginners who don't know how to handle a reactive horse like Panama, and I need to take him out there myself and get some miles under his belt (girth?) before I trust him in the same capacity outside of the arena. I'm not terribly worried, though -- he shows me on a regular basis what a calm, trustworthy horse he is. I don't think I've ever been so excited for spring before! How about you? 60s? 50s? what is that - I don't remember . . . today it was in the 20s, which seemed warm to us - our normal temps this time of year are in the 40s, and we're actually supposed to get there tomorrow . . .
A month ago we were in that same place, Kate -- it had been so cold here that 20s felt warm, and 30s felt like an absolute heat wave! So we are really enjoying our 50- and 60-degree weather now. I was in short sleeves today at the barn, and even as it cooled down in the evening, I didn't put my sweatshirt on -- it just feels so good not to have to hide under so many layers any longer!